Before I continue this post, I must confess, I too have been a flake in the past and still can be. When I’m not feeling something, it’s really hard for me to convince myself to show up or respond to messages. I mean I’ve even written a post about my love for cancelled plans, so me writing this post could be a tad out of character and a bit hypocritical but us humans are allowed to change right…? 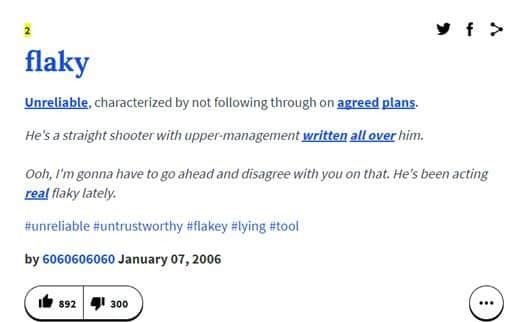 What is the act of being a flake or flaky you ask? Anyway, this year I’ve started off with the mantra of ‘Just get it done’ and I’ve also stopped being the one to make plans with people because I always seem to be the one making the effort. I get it, some people are planners and some aren’t but it’s annoying when you feel like everything is all on you? I’m letting the ‘Let’s do dinner’ come from someone else for once. I wonder how many will come to fruition? Consistency is the MAJOR KEY. Do I need to write anymore on this point, I suppose so. I think the ones who get ahead in life are consistent because their driven by some desire, albeit passion, money or happiness. In this little blogosphere, I have tried to stay consistent with my content, my creativity and who I am. However sometimes a path of inconsistency could open up doors for you to find out what you like and don’t like so try it for a while! Sometimes we never know what opportunities are out there until we ask. Want that raise? Ask. Want that guy or girl’s number? Ask. We are in a world of entrepreneurs, people doing what they want of their own back all because they know how to use their talent and harness the talents of people around them. Whilst being persistent may not be in your nature, try it sometime but there is a fine line between being persistent and pestering; just don’t go down the spam route. Be honest, be you, don’t be afraid to take rejection. Make plans and stick to them (this is funny considering I hate commitment, but that’s for another blog post). If you are the one to cancel, set another date, apologise and move on. Diary invites. Yes, I’ve become that person who now diary manages themselves, so sit down for the month and plan when you’re going to do things, whether it be social, professional or personal. This is a great way to be productive and really time manage yourself. Don’t feel like you need to go into great detail though, you don’t want to feel like your own PA (unless you’re really that busy). Whilst these points may help, the only one that can stop you being a flake is you. Your bed will always be there, so get out once in a while and get like Cardi B and make some schmoneeeey. "Musings: Getting Cosy with Cos Box"
I really enjoyed how you broke this down logically. It really does that effort and commitment to not flake or be a flopartist as I like to say. 😀 I’m a flake. My brother texted me about a bbq at a friend’s place tomorrow, and I really don’t feel like going, so I’ve just ignored it. I feel so bad though, and that I should go.